Discussion in 'Intel Processors' started by Polo6RGTI, Mar 25, 2019. I'm posting the info that I have so far on Intel's new upcoming desktop processors. I'll update the thread title when more information becomes available. I recently updated my MSI Z370 GAMING PRO CARBON motherboard with a BETA BIOS and noticed it contained a new CPUID (06ED) and microcode (B0). The latest released BIOS (0903) for the ASUS Z390 ROG MAXIMUS XI FORMULA also includes the new CPUID and microcode. The 0903 BIOS microcodes for CPUID's 06EA,06EB and 06EC remains unchanged from the 0805 BIOS. 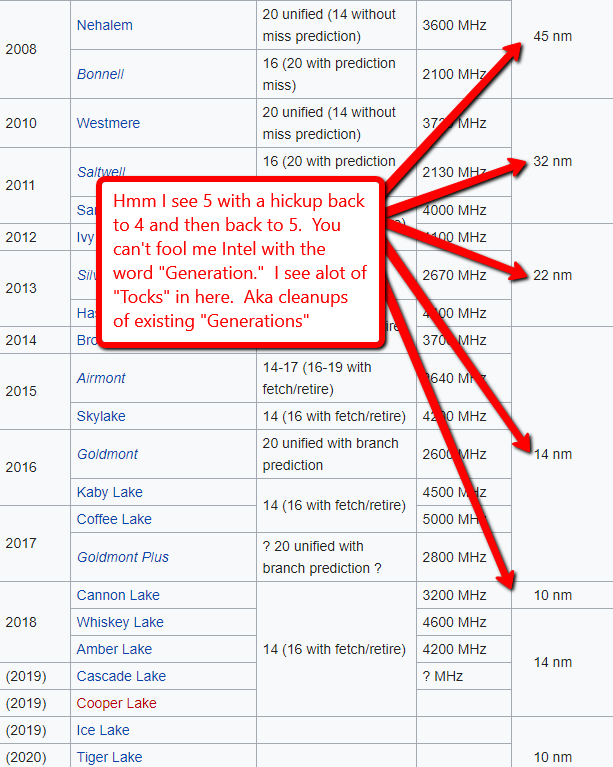 I'm posting the info that I have so far on Intel's next generation desktop processors. I'll update the tread title when more information becomes available. Ugh, looks like 14nm is here to stay for a while longer. How are Intel going to try and differentiate this product from Coffee Lake R? I think they're already at the limit of both the Skylake architecture and the 14nm process as to what it can do. Ivy Bridge was the tock to the tick of Sandy Bridge. Haswell was the next tick after Sandy Bridge. Tick was the architecture, tock was the process. In Intel's new methodology: Broadwell = Process, Skylake = Architecture, Kaby Lake = Optimization, Coffee Lake = Optimization (2), Cannon Lake = Process. A generation to Intel has always been a new product no matter how you define it. Regardless, the naming of the product stack would get quite confusing if they continued to use the same numbering scheme across 3 or more product cycles. If you want to get right down to it it is all nothing but marketing. Legendary Gamer, Vader1975 and Furious_Styles like this. Intel’s 3-8% improvements marketed as new “Generations” of processors is what allowed AMD back into the game. I now wonder if ARM will have any say about this market. Time will tell. ASUS statement added to OP and thread title updated. What's the actual difference between the P0 and R0 steppings? ie, 9900K is listed in both flavors. Or is it literally P0=Coffee Lake, R0=Comet Lake. Re-using the same model name ... then barely anything changed. Bug fixes and microcode and speed path fixes. No wonder my local MC store puts away all 9900k. None are available now, at least i cant see it listed online anymore. The 9700KF in P0 (edit: R0 is the new stepping) will be an overclocking BEAST! Stepping can have a sizable impact on overclocking, even more so than a node shrink in some cases. Even with the most optimistic of Lisa Su's predictions of Zen 2, this will all but guarantee Intel will stay on top for gaming - even without 10nm or Icelake. Gigabyte redacted the new R0 CPU's from the support list. On the CPU Compatibility List, BIOS F8 is not yet listed, so no listing of any R0 CPUs yet. And at my local MC's store, supposedly, i9-9900K are all SOLD OUT! How can that be? I was there earlier this week, there were like TONS of them! I think in some MC's, the 9900K have been shipped back to Intel in anticipating the new R0 stepping to come in? Not really sure how they can SELL OUT all those 9900Ks I saw just a few days ago. I think MC's personnel should know something about it. I will ask them if I happen to drop by within the next few days. Notice the 9350fk. The stepping is the same as the 8350k, but that could be the place holder. It would be nice if they gave the 6/12 CPUs some update love as well. Any release date hearsay, or perhaps confirmation on when these release? Oh well. I ain't waiting another week or 2. My system has already been down 2 weeks. You are not [H]ard until you buy an 8700k, then an 8086k, then a 9900k P0, then looking to buy a 9900k R0. xorbe and Nightfire like this. Something really important that needs to be pointed out which if almost never discussed is Intel's gates inside their CPU's, these are still very fast gates, more so than AMD. 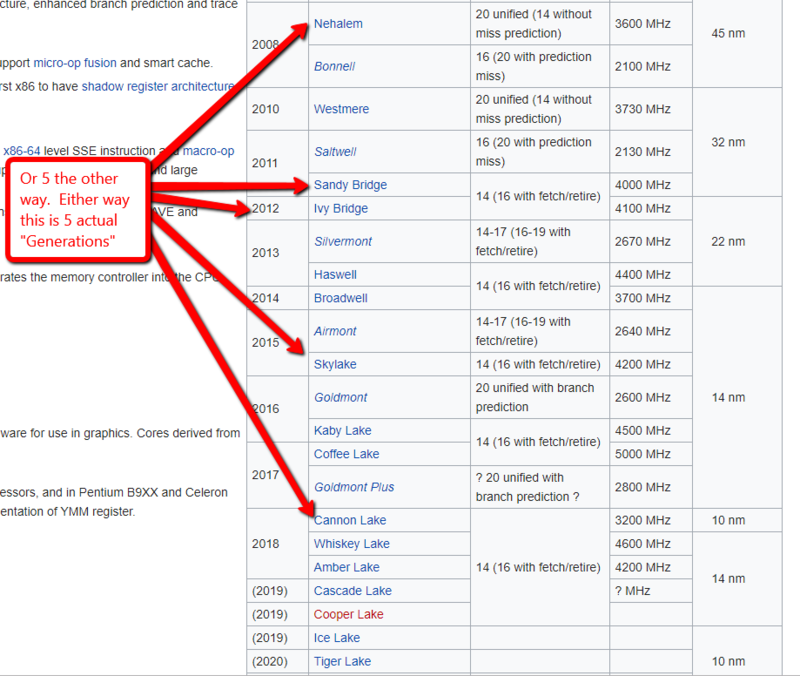 For those of you hung up on 14nm, there is a lot more than just that metric. This is why Intel still maintains the lead over AMD even at a higher micron process. Intel has a new 10 Core CPU coming out the end of this year, I'm fairly certain its still going to beat AMD's 3xxx series CPU's. When Intel does get to 10nm, AMD will be fucked. Yes, Intel will match AMD. Maybe not core for core but we are getting to the point that 10 Core Intel will still not only match AMD's 16 core desktop CPU but beat it. All you guys have to do is look a bit closer to really understand there is a lot more going on than just what the media wants to report. *announcer voice* In this corrnerrrr, the Intel fan boyyyyy! Rifter0876, Doc Doc, /dev/null and 1 other person like this. Gigabyte changed the BIOS Description. And yet, he isn't wrong. Yeah but they do charge you for this feature and also charge for their architecture flaws in branch prediction. At the end of the day, we now have choices and we can vote with our wallet, to each their choice ! MSI released new BIOS updates for the upcoming processors. No BIOS updates yet for the Z370 motherboards. Fairly Certain... AMD is fucked... Intel will match AMD. - Spot on prediction. 10 core Intel will beat AMD 16 core. Well, the current 14nm Intel 10 core can't match a 12nm AMD 16 core, but that will change when both go to a lower node. Spot on again. Pro-AMD media conspiracy for the win! 10 core Intel will beat AMD 16 core. Well, the current 14nm Intel 10 core can't match a 12nm AMD 16 core, but that will change when both go to a lower node. It's at least possible, and realistically likely. Intel isn't just shrinking the node- they're putting out their first new core since Skylake. Most of the competitiveness of the two really depends on how well AMD does with Zen 2. I'd prefer to be optimistic but generally speaking AMD doesn't have such a history of large IPC improvements, or even really fixing the issues that may be 'holding back' a particular architecture as Zen / Zen+ have been perceived by some as having. To spell that out a bit more, if AMD does get their IMC / CCX coupling under control so that the CPU can run at full speed with lower clocked memory and perhaps is a bit less picky with memory in general, as well as working to minimize inter-CCX latencies (as well as interdie latencies as seen on Threadripper / Epyc and likely on future AM4 products), they'll likely go a long way toward eclipsing Skylake on all but the most single-core dependent workloads, including most games. Agree! Though I've never bought the 8086K. I've gone from a 6700k at 4.8ghz to a 8700k at 5.2ghz.. wanted to do 5.3ghz but nope.. then a 9900k at 5.2ghz.. wanted to do 5.3ghz but no.. Both using the same 4266mhz ram. I have a feeling I just need to either crank the vccio voltage to 1.35v or leave it at auto which would prob do the same. I've always try lower vccio cause everyone states you only need 1.25-1.3v for the mem controller at 4000+. Now doubling up the dimms to 4 I bet I do need to crank it. Just worried I'm gona hurt it. Currently lowered the ram to 4000mhz just to keep it stable at 1.32v vccio. And using 1.36v in bios which drops to 1.33v on load on this asus extreme xi board using PLL 7. 1.4v and under is the generally accepted limit for daily use without harm, however it is speculated 1.35-1.4v increases the chip degradation process. Anything under 1.35v is more than safe. F' it honestly. I'm only gonna use this CPU a year most likely.. and its under water delided and direct die. Can't wait to test with auto.. This is hard forums? Am I right? Maybe so I ain’t risking my $500 chip frying until its at least a couple years old , I got 2 kids to feed. So do I! Haha 10 and 14.. sports aint cheap. 19 and 21 and we all OC. But man can they eat me out of house and home smh.